This is a post about the Sun in sidereal astrology. It originally appeared as a thread of tweets on Twitter. As aspects of your becoming, rooted in 1# & #2. Modern astrology often avoids, derides, or out right denounces predictive astrology. But that’s because modern astrology doesn’t possess the tools to be adept at predictive astrology. Plus, it’s predicated on free will which is NOT the philosophical roots of astrology at all. If you’ve followed me for awhile you’ll know that I believe we have very limited freedom of will. And I believe that free will is a tool of oppression. But that’s another conversation for another time. The focus on individual will as opposed to a more collectivist worldview has framed the sign of the Sun in a natal chart as the most important and central part of a person’s astrological make up. This is unfortunate. Anyone born within the same season (30 +/- day period) as you has their natal Sun in the same sign as you. Let’s borrow from Chinese astrology to understand what a season is and how it relates to the natal Sun’s sign. In Chinese astrology, the season of birth which is the month of birth, is important. However, that season serves as a context for the day of birth. This is like the relationship between the Sun and the moon. The Moon being the day, the Sun being the month. The season/month of birth generally defines the level of support the day master/day element has. Specifically it represents the parents, family, home and upbringing. Now, if we translate this back to western astrology, we’ll see that the Moon is the identifying factor in a natal chart as it takes 2 days to transit a sign (as opposed to 30 days for the Sun). A person born in the same season as you (30 day period of the same Sun sign) has to be born within the same 2 day period as you in order to have the same Sun and Moon sign. Conceptually this helps us to understand that the Sun in the natal chart is not a unique identifying factor for an individual. I know this goes contrary to everything you’ve learned, but you must unlearn it. 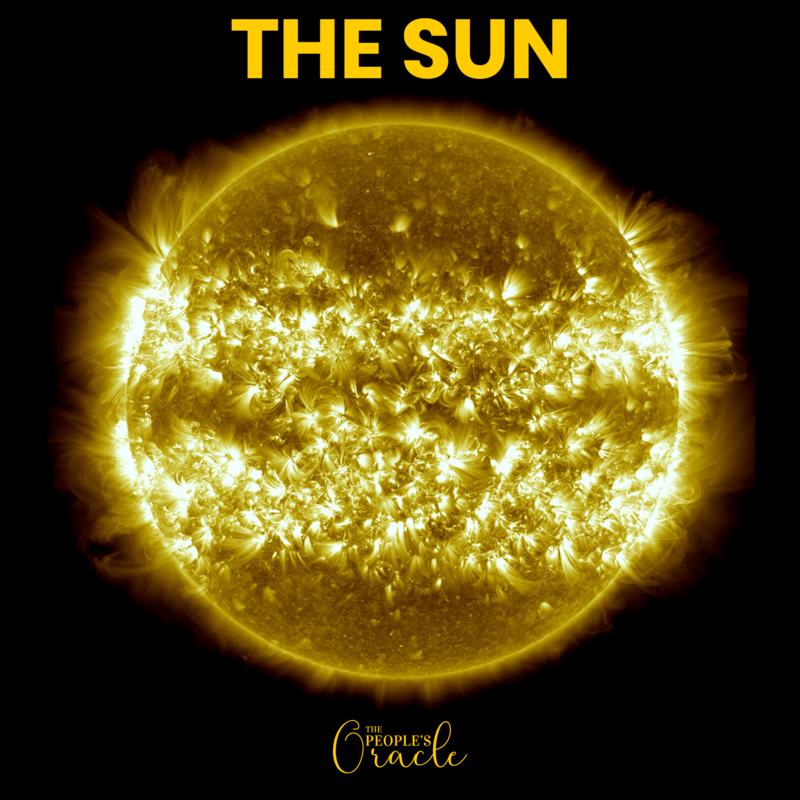 I’m going to offer some philosophical concepts to help you better understand the Sun in astrology. Then I’ll offer some basic significations. The latter will be a result of the former. Have You Ever Seen the Sun? Look at the picture of the Sun that I used to begin this blog post. Have you ever turned your head towards the sky and observed the Sun appearing this way? How does the Sun appear to your eye? Have you ever seen it as it is? A simpler question: What does the Sun look like? All that we see with our eyes is because of the light of the Sun. Objects absorb & reflect certain wavelengths of light providing the appearance of colors. Yet we can’t perceive this light as it is. Google quantum physics & explanations of light and matter, have your mind blown. The primary way that we perceive the light of the Sun is via the Moon. The Moon reflects different amounts of the Sun’s light at cyclical intervals based on the spacial relationship between the Moon, Earth, and Sun. In astrology the Sun is the mind, sight, and perception. You cannot see the mind. You cannot see sight. And you cannot perceive perception. Much like you cannot take your eyes out of your head and look at them. The very nature of the mind and perception is that you cannot turn it back on itself to see it. Just like you cannot see the Sun as it truly is, you cannot see the mind. The Sun is the light that illuminates allowing perception. It’s consciousness, and the lens through which you see yourself—not your physical body, but the concept of yourself held in your mind. The Sun is the concept of your self, the idea of who you are that you project into the world, and that you seek to see reflected back to you. There is no you without your body. When there is no body, there is only the idea of you which is different in everyone’s mind. What is the body in astrology? It’s the Moon. And we know that the Moon is about family, mother, your home, your tribe. It’s the social and physical means by which you come into being. Identity is a funny thing. Social science and philosophy ask and attempt to answer questions about how identity is formed. We know that identity is formed in society/social setting. You and the concept/idea of who you are (SUN) comes into being via your body, your mother, your tribe, your family, society (MOON). There is no you without things. Going back to my comparison to Chinese astrology, it’s clear that in a hierarchy of planets and points that most uniquely identify you and your life, it is the Moon and it’s relationship to the Sun that gives a complete and unique picture. This is why I see astrology as a social science and a tool of divination. It very clearly articulates the nature of human life, the self, and how it comes into being. But, if you believe that who you are is something that exists in this rigid form, separate from your relationships, family, and society, rather than emerging from those things, then of course you think that the Sun is the most important planet in the natal chart. The Sun is the father, significant men, and authority figures. It is your mind, the concept of how you perceive your self, the lens through which your mind perceives the world around you. The Sun is how you think of yourself, yet it says nothing of who you are and what you do out in the world. The Sun says nothing of how others see you. No one can see your mind, and you can’t see theirs either. It says nothing of how you function and the roles you play in life. Implied here is that your self concept/idea of yourself is formed and reinforced by your body, your family and upbringing, your tribe, and the society in which you come up. The very 1st time the Sun returns to the position where it was when you were born, there have been 13 Moons/lunations. That’s 13 cycles of New & Full Moons, 365+/- circadian cycles of sleeping and waking. If the Moon is the body, this is 13 cycles of nourishing and nurturing that body. At that time you answer to your name, and you have come to understand whether or not needs you have and express will be fulfilled. Will someone answer when you cry? Do you experience familiar smells and sights? Is your world one of plenty or lack? Are you touched and played with? All of these things have to do with the body. And the orientation of your body to the world around you and the people in it are what forms the first ideas of who you are. This is the relationship between the Moon and the Sun in your natal chart: how is the idea/concept of yourself formed? You have no identity when you are born. You have no idea or concept of a self or who you are. It is something that develops over time. And every time the Sun comes back to the sign and degree where it is in your natal chart, you enter a new season of becoming aware of this self. That time is around your birthday each year and we call the chart cast for that moment your solar return. The season of your birth, the Sun sign in your natal chart, is indicative of the outer world circumstances in which you were born. It is a transiting moment of time for your mother as well. And what is the mother, the Moon in your natal chart. Wrap your mind around that! What Does the Sun’s Sign Tell Us? Of the Sun sign we ask, who are what determines the lens through which the idea of your self is formed? The planet that commands your Sun’s sign answers that question. SUN in Aquarius & Capricorn are under the command of Saturn. SUN in Pisces & Sagittarius are under the command of Jupiter. SUN in Aries & Scorpio are under the command of Mars. SUN in Taurus & Libra are under the command of Venus. SUN in Gemini & Virgo are under the command of Mercury. SUN in Cancer is under the command of the Moon. SUN in Leo is under its own command. In what sign is your Sun in your sidereal birth chart? Use this guide to find out.